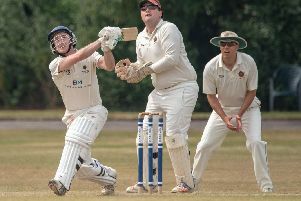 Purbrook missed out on promotion after losing their Southern Premier division three winner-takes-all contest at South Wilts II by 26 runs. The hosts set a target of 225 for nine despite some fine bowling by Aaron Dean (four for 33). Purbrook struggled at the start of their reply – losing four wickets for 67 runs. Dean (56 not out) and Tom Amis (21) led a recovery but it was never enough to overhaul the hosts. Jake Peach took eight for 28 as Portsmouth & Southsea finished their first season back in the Southern League with a 187-run win over Fawley at St James Hospital. Peach claimed the first eight wickets as the visitors were bowled out for 58. Earlier Jack Davies (58) and Shaun Briggs (56) helped Portsmouth & Southsea to post 245. Keiron Dunstan believes his team can go from strength to strength next season. ‘It is nice to finish with three wins on the bounce,’ said the Portsmouth & Southsea skipper. ‘We have to be happy to consolidate and can use this as the foundations for next year. ‘With a little more consistency we could have finished higher. ‘We lost a few games really we should have won. ‘Apart from that we beat South Wilts, who were promoted, and thrashed Purbrook who were up there, too. ‘The club as a whole has had a great season with our seconds and thirds being promoted. Davies finished as the division’s leading runscorer with 642. Dunstan took 26 wickets for his Milton-based side. In division two, Waterlooville finished a creditable fifth in their first season after promotion. They failed to conjure up a winning finale, though. Instead, they suffered a five-wicket defeat to Basingstoke & North Hants II at Rowlands Avenue. In a low-scoring game, Ville were bowled out for a 90 with Alex Smith scoring 21. Sam Hillman (two for 17) bowled well but his efforts proved in vain.